The Bake me Happy competition is in full swing with lots of people rising to the challenge. Chickens have been doing their bit by popping eggs out at an eye watering rate, whilst kitchens have been whirring to the sound of whisks and Sainsbury’s has reported shortages of icing sugar. Not since Delia Smith first showed the nation how to boil an egg has there been such culinary excitement. The Omlet mailbag has been full of photographs of beautiful looking cakes accompanied by tantalising descriptions. One lovely lady also sent in a carefully wrapped piece of cake, which arrived in perfect condition and definitely impressed the judges. So, if you want to make the judge’s job easier don’t hesitate to pop a piece in the post. And don’t forget that there’s a fabulous Omlet Apron up for grabs and the prestigious title of Baroness Bake! Later in the newsletter, Barbara has some good advice on how to keep your garden looking neat and tidy over winter. The forum members have been busy discussing who has the friendliest chickens and the eglu owner of the week is an absolute corker. Can you help? We are reviewing our list of breeders so if you have any feedback – good or bad on the places you have visited to buy chickens from or you have discovered new ones then please let us know. You can do this by emailing penny@omlet.co.uk please also include the name and telephone number of the breeder as well as an address if you have it. And finally, the Omlet Christmas cards have been flying of the shelves, which is great because for every pack sold the Battery Hen Welfare Trust gets 50p to help them in their excellent work of rehoming hens so that they can live out their days as free ranging pets. So if you haven’t yet sent your cards why not stock up on some of these. Some cakes are so good you just can’t resist giving them a little kiss! One of my most frequently asked questions is what damage will the chickens do to the garden? Well, if you’re prepared for them, not that much! The hens may peck or scratch at plants so it’s a good idea to separate anything delicate off to prevent damage. This can be done really easily using fruit cage netting and bamboo poles or even better, the chicken netting we sell in the Omlet shop which is tough, comes in two lengths and is so easy to put up and take down again without getting into a terrible tangle. It’s very easy to section off vegetable gardens or bedding plants and the advantage of the chicken netting is that it doesn’t have to be a permanent feature which leaves you free to enjoy your garden when the hens are in their run. Hens can’t be toilet trained but the droppings can be scraped up very easily and popped onto the compost heap where they will make the most wonderful compost. In summer, droppings on the lawn dry out quickly and can be raked in where they will act as a fertiliser and make your grass grow lush and green. Chickens actually carry less health risks than cats and dogs and as long as they are wormed twice a year, it is perfectly safe for children to be around them, so long as a sensible handwashing regime is followed. During winter it is a good idea to keep them off the lawn where possible because the grass becomes dormant and any damage will not recover until Spring which can result in unsightly bald patches. 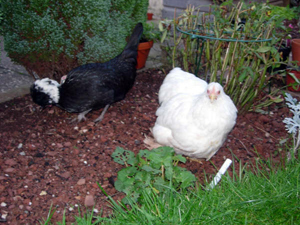 This is a good time to build a permanent bark run which is incredibly easy to maintain and the chickens won’t suffer from being kept off the garden if they are given daily treats of raw green vegetables. There is a guide showing how to build one on the Omlet website. The bark can be raked out once a month and changed for fresh and the hens will be perfectly happy scratching around in it and will even find areas which they can use to dustbathe within it! Paddle stones on top of plant pots will prevent little feet from uprooting the contents and leave the pots looking stylish. The hens love it when you move the pots about the garden because you can guarantee that there will be something tasty lurking underneath for them to gobble up! Watching your hens free ranging is one of the most pleasurable pastimes and with a little foresight, you can relax and enjoy them without worrying about your garden. finds the perfect way of destroying the evidence! 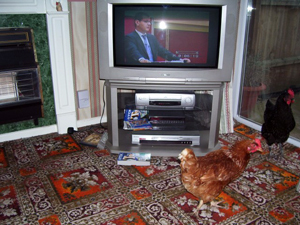 Ratings plummet as chickens walk out! What pets do you have? 2 beautiful bantum chickens also 3 spoilt guinea pigs! If you were stranded on a desert island what luxury item would you have? laptop with internet connection! Do your chickens have a party trick? They’re great at ‘follow the leader'(me!) Also Betty has managed to get onto the roof several times…. :-s (Yes her wing IS clipped!And my house is more than 6ft high! )Oh and between them they destroy mum’s plants. Would you like to be egluowner of the week? Each week we will be featuring an elguowner of the week. If you would like to be featured then read our questionnaire here and email your answers to james@omlet.co.uk . Photos will increase your chances! Isn’t it amazing how chickens take themselves to bed every night? Do you ever wish your children would do the same? 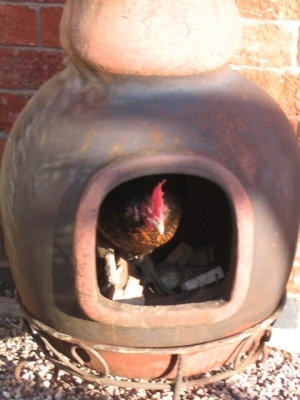 Well you could start encouraging chicken like behaviour by giving them this nifty little seat to sit on. Decorated to look like a chickens nest complete with eggs these seats are great for posture and are rigid and tough enough to be used outside. They are really versatile and fold flat for storage or for taking with you when you go on holiday. The planet Jupiter is exerting its full force giving you the chance to explore new territories and come into contact with some new faces. Sagittarius’ have a generous nature and this, together with your positive outlook on life, makes making new friends easy. If you embrace each new opportunity with an open mind and an open heart you will surprise yourself with how high you can fly – with practice 4 feet is achievable.